The 'Black Hole' punishment cells have become a major but very misunderstood part of Boggo Road mythology. The B Wing of 1 Division also contained two ‘dark cells’, which were also underground but were better ventilated as they adjoined an external wall. The new No.1 Division of the 1970s also had punishment cells, which became infamous as the ‘black holes’. Although these were mostly underground, they were built into sloping ground and so had external ventilation. They were, however, felt to be inhumane and were closed in 1984 under public pressure. In late 1987 the Bjelke-Petersen state government made a controversial decision to reopen the cells in order to contain Aboriginal protesters who were felt to be a threat to World Expo '88 - a story that many believe to be a politically-convenient cover. This move sparked major riots across the Boggo Road prisons. The punishment cells were closed by the state government in 1989 as they were in breach of United Nations regulations regarding the treatment of prisoners. Six new punishment cells were then built into the area where No.1 and No.2 Divisions adjoined. Known as the Detention Unit, each cell here had an individual exercise yard, shower and toilet. Ironically, these were much roomier and more 'well appointed' than the regular cells in No.2 Division. 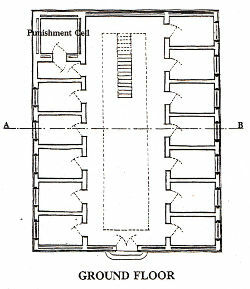 No underground cells were built in the 1903 Female Division, although two blocks each had a ground-floor 'punishment cell', which were two cells joined together to create a cell that could only be entered via a small room (see plan above). These punishment cells were converted to regular cells in 1950, so that each floor then had 14 cells. Life in the punishment cells was extremely tedious. No conversation or tobacco was allowed, and the diet was strictly bread and water. For many the only form of entertainment was a game called 'Find the Buttons', which involved throwing a button into the darkness and then looking for it. It seems that 'Find the Buttons' was played in dark cells around the world throughout the 20th century. 1878: 'Six Hours in a Dark Cell' (The Queenslander): A lively account of an alleged visit to the underground cell at the Petrie Terrace prison. The existence of any such cells is debatable. 1886: 'A Queensland Black Hole' (Queensland Times). An account of Chinese prisoners being locked in a 'black hole' at Charters Towers. 1953: 'Won't See Light While in Cell' (Courier-Mail). 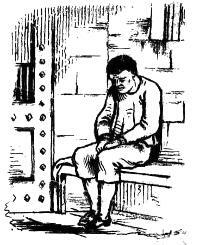 'Slim' Halliday is locked in a punishment cell after another escape attempt.